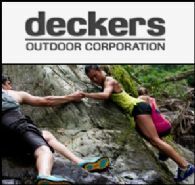 Sydney, May 20, 2011 (Global Fashion Wire) - Footwear company Deckers Outdoor Corporation ( NASDAQ:DECK), known for its sheepskin UGG boots, announced its agreement to acquire Sanuk, an innovative action sport and adventure footwear brand for US$120 million. The acquisition includes initial payment of the US$120 million in cash, subject to certain post-closing adjustments and participation payments based on performance over the following five years. Deckers President, Chief Executive officer and Chairman Angel Martinez, in announcing the agreement, commented "Sanuk is an ideal addition to the Deckers family of brands. It's a profitable, well-run business with a corporate culture similar to ours, and provides substantial growth opportunities". Iconic luxury fashion label Burberry ( LON:BRBY) last night opened its first and most digitally innovative Burberry Brit store in London's Covent Garden. Utilising British metallic materials and top of the line audio and visual technology, the new 10,00 square foot store opening entailed live acoustic performance from Life in Film and a set by DJ and Burberry model Tom Guinness. Christopher Bailey, recently promoted to Chief Creative Officer, who played the key designing role for the store commented, "Music is intrinsically connected to Burberry Brit; it's very much the attitude and energy flowing throughout the collection and the store. It's very modern, it's a little bit dishevelled and it's distinctively British". Richemont (Compagnie Financiere Richemont SA) ( VTX:CFR) the second largest luxury goods company in the world, reported strong sales growth across all segments and regions with record sales. The Groups operating profit has doubled the rate of growth in sales, increasing by 63%. Richemont which owns such brands as Chloe, Montblanc, Alfred Dunhill, Shanghai Tang and Cartier, noted growth through Asia-Pacific have been strongest, particularly in China due to high demand, with the region now representing 37% of Group sales. "We have enjoyed record sales and profits from our Jewellery Maisons and specialist watchmakers, despite the stronger Swiss franc. Profitability at Montblanc improved with progress also being seen in the performance of Fashion and Accessories Maisons. NET-A-PORTER.COM, which was acquired in April 2010, is performing ahead of its business plan" said Johann Rupert, Executive Chairman.